Top 8 Storylines From BCAA Championships: US No. 1s & More! It was a senior vs. freshman showdown in the girls 400m final at the BCAA meet. Jan'Taijah Ford, a senior out of Northeast HS and USC signee, ran a new PR and US No. 1 of 52.17 to win the BCAA title with Piper Freshman, Aaliyah Butler, taking second in a US No. 2 of 53.11. This was the first and probably only time that these two will race one another this regular season as we will be gearing up for the championship season in a few weeks. Ford ran her first 400m of the 2019 season back in February at the Spartan Invitational, running a 54.76. Earlier this week she raced a 53.18 to qualify for the BCAA meet. Ford has had a strong progression, as she has had in years past. Ford defended her 400m title, improving it from last year's race by 1.53 seconds. If all stands as it has this entire season, we will see Ford and Butler become 400m state title winners in their respective classifications. Blanche Ely HS junior, Jevon Williams, has officially made his 2019 season appearance this past week first at the BCAA North Qualifier and then at the BCAA championships and his performance did not disappoint. In Williams' third 110mH race of the week, he ran a new PR of 13.94 to set a new US No.1 and he followed that up with a 37.30 300mH win. Williams is the reigning 3A 300mH champion and he was fifth last year in the 110mH at the state finals. It is a little to early to tell how consistent these times will be for the junior, but this week was a heck of a season opener for Williams. Future Florida State University teammates, Taylor Banks and Cameron Leiba, raced against one another for the first time this season. Last week we saw Banks open up his season at the Miami Hurricane Invitational in a 10.50 win. This week he repeated that win a 10.50 BCAA Championship win. His future teammate, Leiba, was not going to let him win without a fight. Leiba ran a new PR of 10.53 to finish second to Banks in the 100m final and it was his first loss of the season After winning the 100m at John Battle III All Star Invite, Cardinal Gibbons home meet, and the BCAA North Qualifier. This will most likely be the last time we see Leiba and Banks race against one another during the regular season as Banks will compete for the 4A state title and Leiba the 3A state title. FSU is gaining two great 100m athletes following graduation. Cardinal Gibbons junior, Jackson Marseille, continued his undefeated high jump season with a BCAA win of 2.07m. The junior kicked off his season with a 1.57m win back in early February at a Fort Lauderdale home meet and then a few weeks later jumped a 2.18m at the Spartan Invitational. Marseille has been consistent at the 2.00-2.07m range. He was fifth at last year's state finals and if he can stay consistent and improve back to that 2.18m that he hit a few weeks back, we could see Marseille be very competitive for the 2A state title. Caleb Snowden of Dunbar and Keenedy Sauder of Calvary Christian will have something to say about that with their 2.05m and 2.03m 2019 season bests. Emelia Chatfield, Ashantae Harvey, and Alexis Galsco all ran new PRs in the 100mH to finish first, second, and third at the BCAA championships. Chatfield won the event in a 13.61, setting a new PR in prelims of 13.59, improving her season by season personal best by 0.71 seconds. Ashantae Harvey and Alexis Glasco have had huge improvements week by week to really have a strong progression in the 100mH this season. 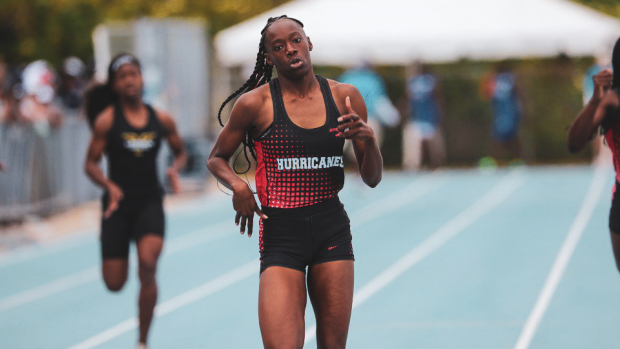 Harvey started her season with a 15.74 100mH time at Louie Bing and brought that time down by nearly a second at the John Battle All Star Invite in a time of 14.94 and then had a huge PR of 13.84 to finish second at the BCAA meet. Glasco has had a similar progression, looking stronger week by week in the event. She kicked off her season with a 14.74 at Louie Bing, brought it down to a 14.33, and ran a new PR of 13.92 this weekend. As it stands now, with her new PR, Ashantae Harvey looks to be the favorite for the 2A 100mH and 300mH state titles and Chatfield and Glasco could go one and two at the 4A state meet, but Rayniah Jones of Miami Southridge will not make it an easy win with her 13.68 current season best. Demetris Dorceus scored 20 points for Fort Lauderdale this weekend with his 46.41m Discus win and 15.79 shot put win. Dorceus did not throw close to his potential that he has in weeks past, but he has been consistent with his marks. With his best mark this season, Dorceus is predicted to finish second at the 4A state finals against his twin brother, Desmond Dorceus to score a total of 18 points in one event for Fort Lauderdale. If the Dorceus twins can improve their shot put marks and stay consistent come state, they could put pressure on Jalen Rivers of Oakleaf, Jaden Gary of Everglades, and Gary Cooper of Columbus to score another 18 points. Dorceus win this weekend shows he can remain consistent during championship events as we head into the post season. Kerrigan McGreevy came off two huge PRs in the 1600m and 3200m double at Bob Hayes last weekend running a 5:04 and 11:26 to win both events. McGreevy came back this week with another win and new PR in the 1600m of 5:03. Dillard seventh grader, Chrstiana Coleman, ran a smoking time of 5:05.19 to finish second. McGreevy and Coleman battled it out a second time in the 3200m with McGreevy taking the win in a time of 11:31.93 and Coleman in 11:46.48 -- a fantastic double for the seventh grader. We saw Hannah Lowenstein come back for her 2019 season last week at the Bob Hayes Invitational, placing second in the high jump in a mark of 1.68m. Lowenstein then came back this weekend to defend her BCAA high jump title and jumped a new PR of 1.77m. The St. Thomas Aquinas junior finished fourth in the event at last year's state finals and as of now, she is tied with her teammate Zatoria Thompson for the top 4A spot. If St. Thomas could accomplish a one, two sweep at the state meet it could help them secure another 4A team title.